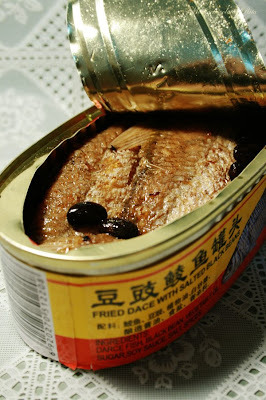 I was talking with Josh of Cooking The Book the other day about canned fried dace with black bean 'dou si lian yue 豆豉鯪魚' and how difficult to find them these days due to limited import because of suspected contaminated fish used for manufacturing. 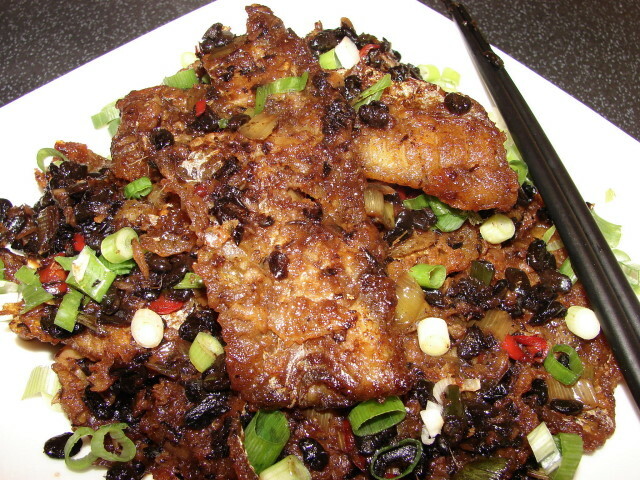 I have a craving since for this salty chewy leathery fish with yummy black beans. Couple of days ago I was shopping in Lidl and they had frozen pollork fish fillets* on offer. I then had an idea I could use this to make fried fish with black beans like the can stuff. Not knowing if this will work I have to try now I have the idea stuck in my head. Pollock fish fillets are very thin, not very tasty fish IMO but I think will work for this recipe. If you don't use Pollock, other fish fillet is ok too as long as they are quite thin, no thicker than 1cm thick. I defrosted the fish around 800g slowly in the fridge. Then lightly dust the fish with plain flour. Heat about 1.5 cup of oil in a wok till hot and fry the fish in several batches till browned, dried and crisp. Remove oil and clean wok. The fried fish shrunk quite a lot to nearly half its original weight. Be careful not to break up the fish too much during frying, do not flip it too often let one side gets crisp before turning. I chopped 2 large cloves garlic, one 1" chunk of ginger, l large red chillies and 2 stalks of spring onion. Then put 2/3 cup loosely packed black beans (dousi) in a sieve and rinse them, drain thoroughly. Next heat about 1/4 cup of oil in wok till medium hot, then fry the black beans in oil medium high heat for around 1 minute till fragrant. Then throw in the chopped ginger, garlic and chillies, continue frying for another minute till fragrant. Add 1/4 cup light soy sauce, 1/3 cup Chinese cooking wine and 1 heap tbsp of sugar, stir for a little while. Then add in the fish give it a quick stir. Now pour in enough water to cover the fried fish, around 1.5 cup water. Let the liquid come to a boil. Cover and let simmer for around 15 - 20 minutes, take a piece of fish and check if it is soft enough (not too dry and chewy) if not simmer for a little longer, then high heat to reduce the sauce to nearly dry. That is it. My copycat fried 'dace' with black beans is done. Ready to plate up. I then sprinkled a little spring onion on top. The result was surprising impressive, I honestly think it's pretty close to the real McCoy. The flavour was good. Next time I think I will add more black beans. Here are some pictures to show you the result. Does look like the real thing I dare say. This is a blast from the past - I remember eating fried dace from a can when I was little but I struggle to think when I last ate it. Used to eat it with congee and other stuff as a kid. Thanks all for the comments. The can stuff was poor's man food now it's nearly £3 each if you can find it. I have not had a can for many years too. Lots of stuff from China are contaminated these days, better be careful than sorry. Love it. Definitely one way to get around the contaminated tins. Thank you Sunflower. It turned up perfect. 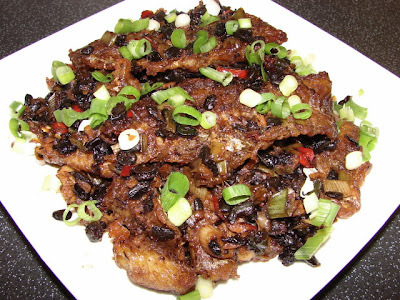 By the way, do you have recipe to make 五香肉丁？ just like the one that comes in can from China. 五香肉丁 not yet. It's on the list to experiment. Will post if I get it right. I used 1 pound of catfish nuggets with about half of the ingredients listed and fried the nuggest until crispy inside and out. Excellent recipe and directions. Thanks a bunch. Now I can enjoy this any time I want without a trip to the local Asian grocery.